Peter David and Ariel Olivetti take readers on a tour of the final days of the (somehow still sort of) mighty Avengers. Though it's not a tour I'm awfully fond of. 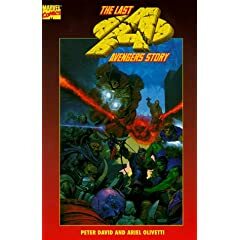 In the age of "The End" stories, which pervade the Marvel line of comics these days, you might think that Marvel would retitle this story and, or at least reprint the trade paperback, which I don't think I've ever actually seen in a store or at a show. I had to read the two prestige format, acetate covered comics that comprise this series. Here is what I recently wrote to a fellow comics aficionado. LAS didn't have too much oomph. I did think it was really cool what they did with Ultron becoming more 'human' and the Vision melding with Ultron. Maybe a second reading in the near future will prove more enjoyable (now that I know what to expect), but it seemed like a mostly dry story, and was it even mentioned whatever happened to Tony Stark? I'm thinking it was in that battle some 19 years before, but since I can't be sure, his death, or the mention of it, was not very memorable. Basically, there was some cool characterization, but not much. David introduces readers to some heir Avengers, who have inherited powers or skills from parents who were Avengers, such as the lame daughter of Hercules, the daughter of She-Hulk, and the son of Black Knight. There is also an interesting twist on the Grim Reaper and his brother. This story didn't have much emotional impact and it suffers for it. Perhaps some of this non-enjoyment comes from the fact that I've often thought the Avengers were cool, but never felt they jelled much, therefore never cared much for almost any roster. I have similar feelings for much of the Fantastic Four. Perhaps if I read the original stories, it will help me get a better feel for and understanding of these two titles. I've read dozens of each of these titles, whereas it didn't take more than a hand full of X-Men related comics to get me to read hundreds, if not thousands of X-Men comics.